Representatives from local produce distributor Harvest Santa Barbara participated in a UCSB-hosted meeting about efforts to cultivate relationships with small farmers, which is among the projects being pursued in the UC Global Food Initiative. Staff members from UCSB's sustainability, housing and dining teams met with counterparts from UC Merced as well as area farmers and Harvest Santa Barbara. Participants in the UCSB-hosted small growers meeting discussed the challenges and opportunities of building tighter ties with local farmers. With the goal of sharing lessons learned and helping to build a toolkit for other campuses to employ, UC Santa Barbara is partnering in a systemwide effort to foster closer connections with California farmers. Such ties are seen as a win-win, offering support to small, regional growers hoping to do business with the UC and, in turn, boosting the ability of campuses to procure more local, sustainable and organic produce. The nascent endeavor to cultivate working relationships with farmers is among the many ongoing projects that comprise the UC Global Food Initiative (UCGFI). Unveiled by UC President Janet Napolitano in July, the UCGFI will harness the system’s collective excellence in research, outreach and operations in a sustained effort to develop, demonstrate and export solutions — throughout California, the U.S. and the world — for food security, health and sustainability. 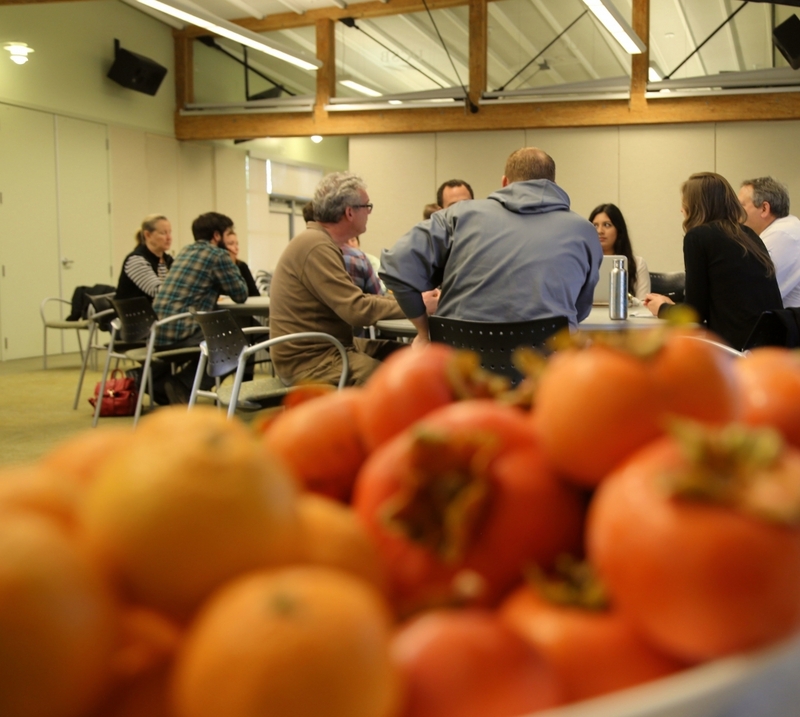 Several staff members of UCSB’s sustainability, housing and dining services teams, and a handful of their counterparts from UC Merced convened at UCSB for a collaborative discussion about the challenges and opportunities of growing closer ties with local farmers. The meeting also included representatives from Harvest Santa Barbara, a regional produce distributor, and some area farmers themselves. The challenges of procurement, menu planning, quality control, outreach and education, even behavioral change, were among the many issues on the table at the UCSB-hosted brainstorming session that culminated in a tour of Harvest Santa Barbara’s warehouse not far from the campus. Working with farms across the region, the homegrown operation supplies UCSB with much of its local and sustainable produce. Though not considered an agricultural school in the traditional sense, UCSB is a natural leader in the push to boost sustainability — and health — by buying and promoting local and organic crops. The campus is in the top of the class when it comes to such practices. Besting, by years, a UC goal of procuring 20 percent sustainable food products by 2020, UCSB’s Residential Dining Services by 2013 purchased 38 percent sustainable foods; 41 percent of its produce was grown locally, within 150 miles of campus, and 15 percent of it was organic. Food wasted in the dining commons has been cut by more than 50 percent since the facilities went “trayless” in 2009, a move that has also saved some 1 million gallons of water and benefitted student nutrition by promoting better portion control. Today, every ounce of unconsumed food is composted; the campus earlier this year received its first load of soil created entirely from its own composting efforts.